Here Steve, from Tonka Cycle & Ski in Hopkins, MN is a cyclist’s angel, here helping a rider on a 4th of July bike ride with a tire problem. This photo was taken this year on the Tour D’ Amico where Tonka Cycle was on hand at each of the rest stops to assist riders. Find more events, bike friendly places to explore and cyclist’s angel in the new Minnesota Bike/Hike Guide. 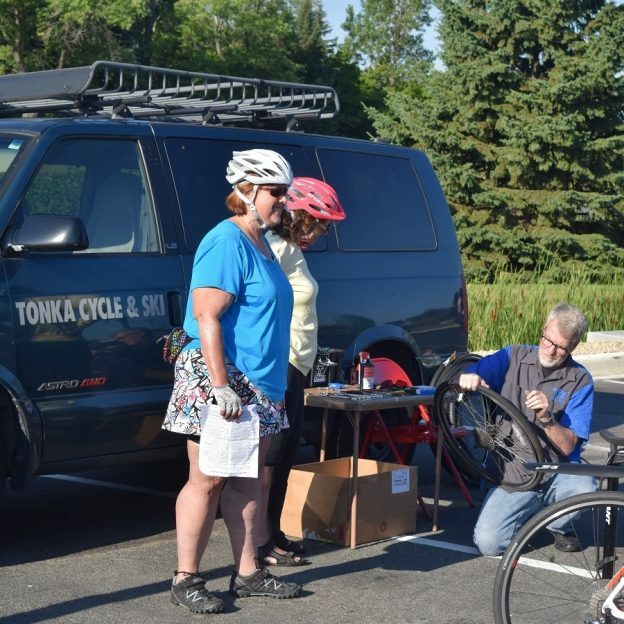 This entry was posted in News and tagged 4th of July Bike Ride, A Minnesota Bike Event, Bike repair station, Hopkins MN, Tonka Cycle & Ski, Tour D' Amico on August 13, 2016 by Russ Lowthian.